In Dawit L. Petros’s video “Notations for a New Pan Africanism,” he carries four painted barellas through four Boston neighborhoods. You could call Dawit L. Petros a man without a country, or a man with many. He was born in Eritrea in 1972 during that East African nation’s conflict with Ethiopia. His family moved to Ethiopia, where they were briefly imprisoned. Over the years, they lived in Kenya, Sudan, and England, before they settled in Canada. Now Petros lives in New York. The artist filters his story and questions about identity, through a modernist lens in “Dawit L. Petros: Sense of Place,” now up at the Museum of Fine Arts. It’s the second small show the museum has mounted this year spotlighting a graduate of the School of the Museum of Fine Arts; Petros got his MFA there in 2007. Petros makes smart, finely tuned photos and a video with undeniable visual panache, but the head-to-heart ratio is off. The incisive ideas entwine almost too nimbly, with no ragged edges or soft spots. His own compelling story gets distilled into abstraction, and trades its humanity for some whizz-bang intellectual sleight of hand. Despite its dazzle, it is arid and detached. Petros’s art is a conceptual sandwich, layered with slice upon slice of encoded meaning. Some springs from culture and place, some from art theory. His basic building block in many of the works is a barella, a gurney of sorts made of two poles supporting a slab, used in the developing world to move goods by hand. Petros stylizes the barella into a painting-sculpture hybrid: A boldly painted square suspended between two wooden bars. All at once, it’s modernist, minimalist, contemporary, and even trendy. In his crisp “Barella & Landscape” series of photographs, he throws landscape into the mix. 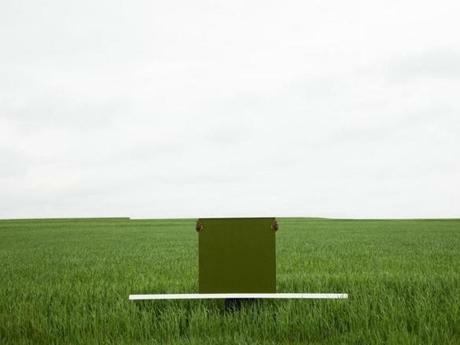 He goes out into a field in Osbourne, Kan., or to the waterfront here in Boston, and places the barella so that one edge of the square lines up with the horizon. In one fell swoop, he co-opts the landscape — whether it’s the flat, grass-swept field or the weathered diagonals of planks on a pier — into a modernist grid. It’s rather ingenious. He’s there, too, standing behind the barella, nearly disguised by it and up to his hips in grass in “Barella & Landscape #3, Osbourne, Kansas.” All you see gripping either side of the olive green square are his brown fingers. Enter into the equation the artist as performer. Those fingers magnetize the eye; he’s human and real, if almost hidden. Add, too, freighted questions of race. There’s much going on in this relatively simple image. For this show, Petros made a video, “Notations for a New Pan Africanism.” In it, he carries four of his painted barellas, one at a time, each a sunny tone reminiscent of African textiles, through four Boston neighborhoods. It has the same effect as in the photos. Jersey barriers, warehouse walls, and more whirl around the clean center of a bright orange or green square as if it were the eye of a hurricane. The short video has a brisk pulse and street noises in the soundtrack. When it transitions from one neighborhood to the next, the screen bathes luxuriantly in the color of one of the enamel-painted barellas, reflecting sky and shadows in the shimmers of orange, green, yellow, or blue. You can see the tiny dimples in the paint. More than anything else, this contemplative attention to texture takes Petros out of the art theoretical world and into the real one. Yet that’s where he missteps, as if he’s not at ease there. “Addischrome No. 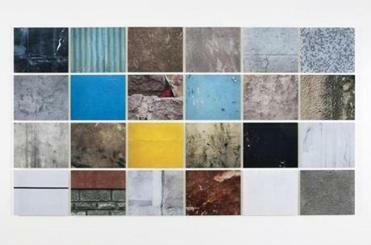 4, 24 Ready found colour and exterior walls on the way around the boundaries,” a four-by-six grid of photographs, features, in the vein of Aaron Siskind, close-up images of stained, painted, and deteriorating walls. Petros took the photos when he returned to Ethiopia, after 30 years away. You can sense a would-be Proust in this piece, searching for his madeleine in the grit of rusty, crumpling metal, or a snaggle of red yarn on a shelf of tired concrete. It’s a gorgeous array, yet the cumulative effect befogs. Does he really connect emotionally with any of these images, or are they just sharp aesthetics? This evocation of Ethiopia might be anywhere. The title places us in Addis Ababa, but also around the boundaries. There but not there. With this alluring degree of physical detail, however, that wavering is elusive and exasperating. It feels like intellectual gamesmanship. Also on view is a wall installation of Petros’s painted barellas, which reads more like a souvenir for coming to the game than a fully realized work of art. Maybe, because of his history, Petros simply can’t land in a particular place, and that lack of attachment leaves his very smart work without sentiment. Instead, he sifts some highly charged themes through theory, and they come up bright, even crystalline, but drained of their juice.